Here’s all the class details. I hope you can join us. Give us a call at 410/296.0405 to sign up. These classes are going to fill fast. The Exclamation pendant is a classically elegant and wearable piece of jewellery that will ensure you make a statement without saying a word. The pendant features a large pear-shaped crystal and round rivoli, both bezelled with sleek closed backs and suspended from an attractive spiralling rope with a matching pear-shaped beaded clasp. 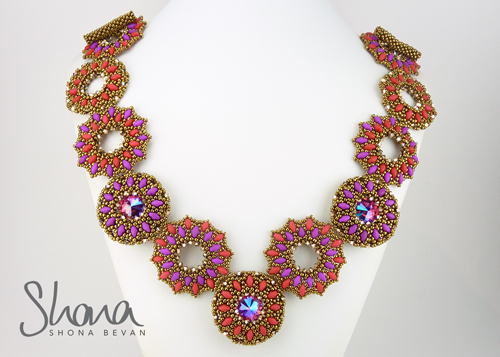 This project is suitable for intermediate beaders with experience in peyote stitch. Kits will be available in Blue, Green, Lavender, Astral Pink, Rainbow Dark. Class fee is $245.00* and includes kit, teacher’s fee, lunch and dessert. Beading needles and 6lb fireline are not included in kit but will be available if you need them. *Deposits are required at signup. Create a revolution with this striking v-shaped necklace that combines Czech Superduos and Swarovski crystals. Three different circular components unite to showcase the beauty of the Superduos and contrast them against the sparkle of a set of three Swarovski Elements Rivolis. Class fee is $285.00* and includes kit, teacher’s fee, lunch and dessert. 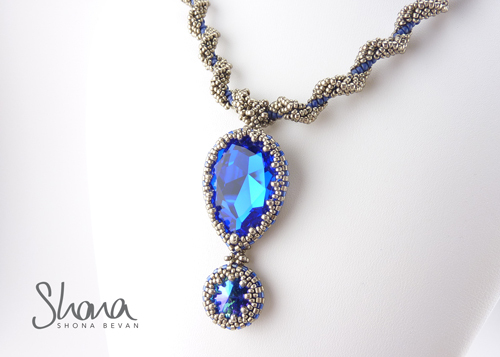 If you crave more glamour and sophistication in your jewellery box then Eleganza is the ideal project for you. Using Swarovski Elements and Miyuki seed beads each component showcases either a coin pearl or rivoli and can be combined to make a complete set of matching items. Whether you chose the classically beautiful necklace, the subtly elegant bracelet or a glamourous a pair of earrings this project is sure to delight you. Suitable for students with experience of peyote stitch and right angle weave. Class fee is $285.00* and includes kit for necklace or bracelet and earrings, teacher’s fee, lunch and dessert.